Braving a solo existence in the sky, bush pilots are often the adventurers that link the lonely inhabitants of distant lands. Soaring above the few wild places left on our planet - across endless deserts, tangled jungles, jagged mountains, treacherous plains of ice - these unique pioneers serve as doctors, missionaries, and communication links for their “neighbors” residing in the desolate regions. 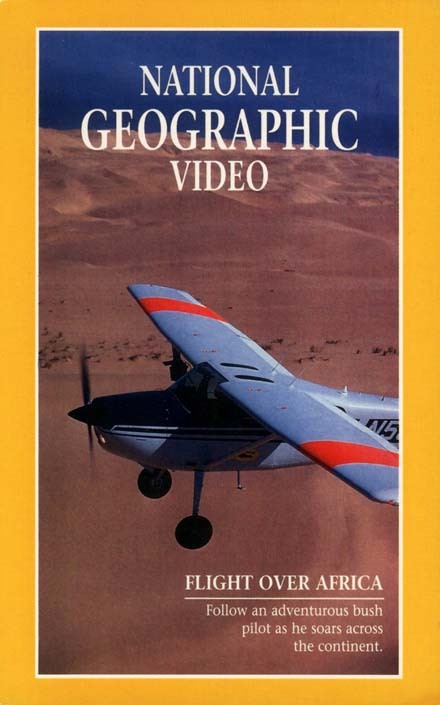 In December 1990, bush pilot Tom Claytor set off on a quest that will ultimately take him to all seven continents. Flying a small, classic bush plane, Claytor is working his way around the globe by taking on odd and dangerous challenges which only highly skilled, and experienced bush pilots can perform. From scanning the vast wilds of Zimbabwe for an injured rhino and tracking elephants in Botswana, to wandering through the relics of diamond mining ghost towns in Namibia and exploring the thundering Victoria Falls, National Geographic invites you to share in the remarkable experiences of the FLIGHT OVER AFRICA. Documentary length: 60 minutes. Format: VCD (VCD can be played on DVD players). Flight Over Africa (English) Herr Der Lüfte (German) Pilots D'Afrique (French) Volando Sobre Africa (Spanish) VCD with Chinese subtitles. This is a Thai Film in which Tom Claytor plays the role of "Pierre" - the French pilot who brings the first aircraft to the Kingdom of Siam in 1914. Siam was the first country in Asia to have an aviation program. 70 Thai pilots were part of the Thai Expeditionary Forces sent to France during WWI by King Rama VI, and this is the reason that Siam was subsequently never colonized by the English nor the French. This film is about the meeting of two cultures - East and West. They are not the same. It is also about believing in the power of your dream - as a young farm boy has a dream to fly. Pierre hires the boy as a mechanic's helper, and then secretly teaches him how to fly. The aerial shots in the film are beautiful - from Pak Chong, Nakorn Sawan, Suphanburi, and the jungles near Burma. This is the first Thai film to use actual aerial footage (which was shot from a C206 and a PZL104 "Wilga"). There were 4 scale models of the Breguet-14 used in the film. The film is in French and Thai. Tom's credits were for co-producer, actor, pilot & aerial photography. First Flight webpage. (First Flight premiered at Cannes Film Festival in 2007) Article: "Sky of Dreams". Length: 90 minutes. Format: DVD (English subtitles). "CONGO" PRINT - 40cm. x 60cm. This is a painting about the unknown - ahead - and the fear of it. It is a real place - the Oubangi River in Congo. And it is about a real experience - the power and the moment of the decision. The writer, Tom Claytor, and the artist, Larry Norton, ventured together up this river in 1992. After a four-hour flight and many storms, it is late afternoon. The destination is a small town along the river called Impfondo. This is the closest town to the mysterious Lake Telle where the Pygmies believe there is a dinosaur called Mokele-mbembe (rainbow). A storm looms ahead on the river. Night is approaching. To divert around the storm might mean missing the town and losing precious time. 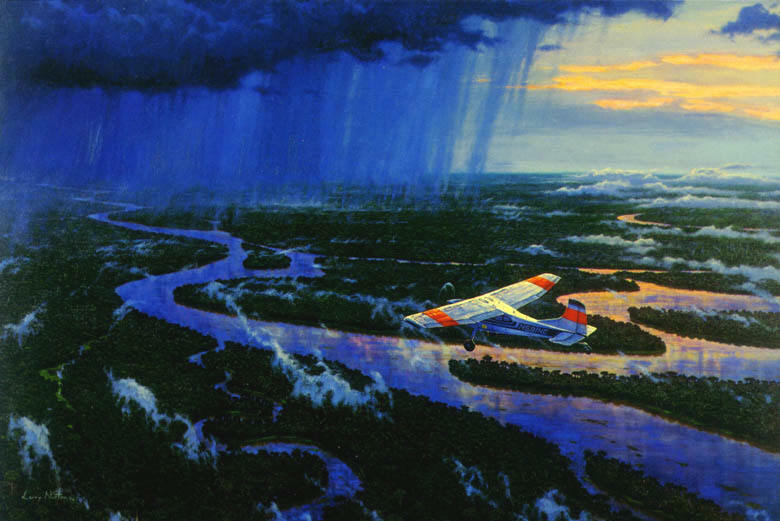 The small plane descends low and follows the course of the riverbank through the storm to the dimming lights of a misty town. The fear is of the unknown - before the power of the decision to turn around or to carry on. (Original: Oil on canvas by Larry Norton. Prints: High quality 40cm. x 60cm. with white border and title in script at the bottom. Cost: US$30). "SAHARA FLIGHT" PRINT - 40cm. x 60cm. This is a painting about wonder and mystery. It is about going to a place where we are not really meant to go. The Sahara desert is the largest desert in the world. It is a forbidding place, and yet it draws you to it. It is a land of extremes and bizarre formations. The Tuareg call it "Tanezrouft" - the land of thirst. Tassili loom like towering rock mushrooms above the sand. Barchans creep like crescent moons across the surface. Vast ergs look like angry oceans smoking in the wind. The Ahaggar massif and isolated dome mountains rise abruptly from the desert floor. The sand is like the sea; it is wavy, then flat. It flows like rivers through rock, and the horizon is endless and empty with the dust of the harmattan. This is the Sahara desert - a 3 million square mile expanse across a continent - and this is the gateway to Timbuktu. 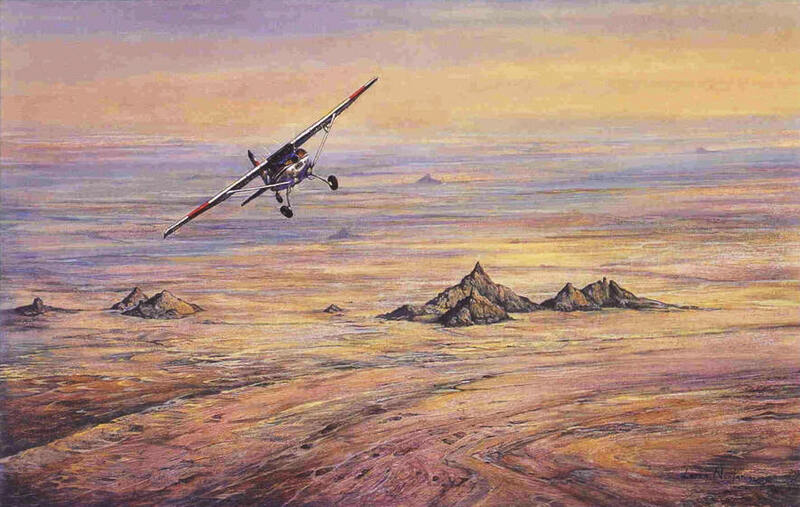 The pilot Bill Lancaster took off in his Avro Avian "Southern Cross Minor" in 1933 to cross the Sahara desert. His mummified body was found 29 years later by a French Army patrol. The British explorer Alexander Laing was the first European to reach Timbuktu; the Tuareg killed him. The first to return alive was the Frenchman René Caillé in 1828; he had disguised himself as an Arab. Timbuktu is an ancient city of mud being buried in dust - even the Niger river is drifting away from it - yet there is an allure and attraction to this far away place. The city began as a Tuareg encampment in 1100, and its name comes from a slave girl "Buktu" who was left to guard the "tim" (or place) of her master’s well. It is timeless and preserved by the desert. The trans-Saharan caravans passed here with gold and salt. Songhai devil worshipers still beat gourds suspended on water to speak to the underworld. Tuareg nomads perched on camels emerge from the desert. The men are wrapped in fierce blue veils, and the women are adorned with beautiful silver crosses. (Original: Oil on canvas by Larry Norton. Prints: High quality 40cm. x 60cm. with white border and title in script at the bottom). These are artist's sketches in preparation for the actual painting. The painting has been delayed due to political problems in Zimbabwe. 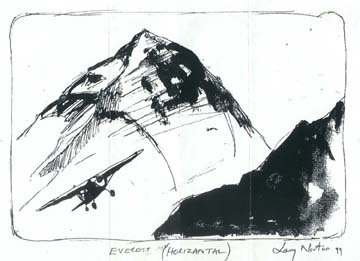 (Click this sketch to see some of Larry Norton's other work). (Original: Oil on canvas by Larry Norton. Prints: High quality 40cm. x 60cm. with white border and title in script at the bottom). WORK IN PROGRESS. Great Hat. 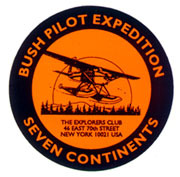 Beige with Black Stitching of "Bush Pilot" on the front. The best thing about this hat is that when it gets dirty, you can throw it in the washing machine to clean it. Lasts a long time. These stickers are high quality waterproof fluorescent orange vinyl with black print. If you go anywhere in Africa, you will usually see them at remote airports. I have been using them like bread crumbs to track my progress in case I ever disappear. Communications are sometimes difficult and this system has worked okay so far. US$2 each.